It wouldn’t be hard to beat last summer. Summer of 2010, my dad’s health suddenly went off a cliff and we lost him on August 2nd. I still bawl my head off when I hear “If Ever I Should Leave You” or “Try to Remember the Times of September” — a song my dad sang during my childhood if I was alone in the car. I am sure I always will. But this has been a sweet summer. I didn’t oversubscribe Vivien in camps. Rex is a great playmate for her so I don’t have to knock myself out driving around for playdates. My dad would have loved our new backyard. It was so much fun to finally be settled. That was our summer vacation. That we could stay put. I was still churning out some Cool Mom vids, but I did take note that traffic is DOWN in the summer. Moms who want a chuckle don’t have the same downtime to come to Cool Mom and check out my latest witty bit from my kitchen. So, I put together a little “Best of Cool Mom: Summer 2011”. Some of the better vids that maybe you missed while you were slip ‘n sliding with your kids. Here is a story of one sweet man who has followed me from neighborhood to neighborhood. He has been with me through good times and hard times. He shows up with good food for me and wants to see me happy. Cindy Joung has been my admin on cool mom for the last several months. She has a full time job, the care of me and my humor probably takes up 28 minutes of her week. But, it’s an important 28 minutes to me. She is patient and tech savvy, smart and kind. She gently nudges me when I need to write an intro to a vid. She seems to have the qualities that are good to have in a spouse. But, who knows? Who knows what we will be like once we are married. Cindy is about to leave town for a couple of weeks because she is getting married. I love this picture of her and her man. She said she is usually the sour puss and he is the sunny guy, but she does have an infectious smile. I’m very excited to see the dress, her venue, hear who got too drunk at the reception. But, my cynical married lady kicks in pretty hard. what would you tell Cindy or any gal about to get married about being married? Advice to navigate that life after the honeymoon. Oh, I might have said, “it’s all down hill after the honeymoon”, but dude, I’m tired. More truth: kids are brutal on a marriage. Marriage is a breeze pre kids. The biggest concern is keeping your legs shut around other men and being polite to the in laws. Also, good to hear the “wish I knew it then” type of wisdom. Lay it on her! She will read this before the wedding and hopefully when she gets back. I hope her husband knows I still get 28 minutes of her. Just last night I was at my neighbor’s house for her husband’s birthday party. Another neighbor brought a mac and cheese she had made that blew any chance of me trying to shed some weight this week. Delish. I took Rex home when he was tired and my friends walked Vivien over, laughing with the other little girls when it was her bed time. Now, that’s good neighbors. I hid the cake for the surprise party in my fridge, albeit turning up my nose at the lousy supermarket cake, and stored the ice. Now, that’s good neighbors. We all know of bad neighbors, but what about NONE neighbors. The lights go on and off, but these phantoms pass with little detection. 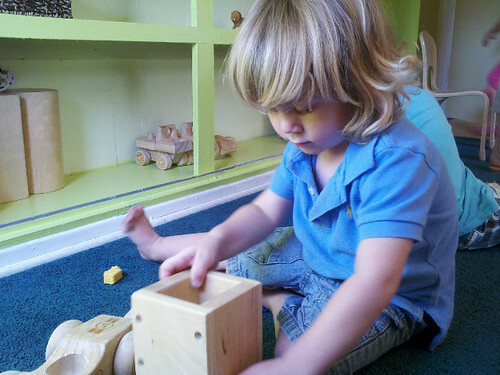 The call it transisition… two year old’s who are starting down the pre school path. Do they Need to go? No, certainly a pile of blocks at home would make them plenty happy. But, us parents decide, “it’s time”. Time to get these little chubby legged beauties socialized. Vivien started preschool, five days a week, at two year nine months. I couldn’t do that with Rex. 1) because I’m no longer a trophy wife and need to pay my mortgage, and not blow the savings on preschool 2) since he is my last baby I could not give him up so young. I know what’s coming. Sullen, no cuddle, where’s my allowance teen years. I want to savor, “momma, I love you.” as much as I can. So, I found ( I’m not going to use the “we” pronoun, school hunt is all me) a nice school that takes em young and let’s you do a few days. Rex qualified for the 3 day a week 9 to 12. Gulp. How about 2 days? I said. Okay, he’ll be the oldest, but that’s fine. It’s a sweet, ernest school. We had to go to three meeting meetings a couple of playdates and the teachers visited Rex at home before the school began. Viv’s was an A list Hollywood school that just wanted the check to clear. The first time parents looked very serious about all of the dictates of the school. “don’t say, “good job.”, by the way, that’s tough. Monday was Rex’s first day at school. I, and the other moms, stayed at the school till the end. Which was about 11, because the kids all were pooped from focusing on sand, water, trains. Oh, the life. Tuesday, I stayed again. I know why Rex was tired when he left. He is tiny and was concentrating for 2 hours on stuff that wasn’t Bubble Guppies. But, why was I so bushed? I sat and tried not to talk to the other moms — they tell you not too–read a People magazine and my Android. I was starving and tired. She stifled her laughter. That made me feel good. Next week I told Rex I’m going to leave him there for a little bit, but I will come back. Mommy always comes back. “You will?” The teacher told me not to rush it or they might regress. Like, poop in their pants regress, cause I think he is still there. By the way, preschool teachers who change diapers, you are stars. Thank you and I don’t know how you do that. Rex seems to be enjoying himself. Could I have just kept him at home? Yes. Is this an expensive way to get a couple of morning workouts in? Yes. I think I found this place and went with it, but I didn’t need to. I don’t want him to go to school more than this. If I was working full time that would be a different story, but I want to be with him. I think my daughter is in school too long. I see why people homeschool. Well, except for my children would be feral if I was their teacher. Now, the next test is when I do leave Rex. Will he cry? I think so. I take that name in part as an ode to my Dr. Phil pal Lenora of Free Range Kids. It’s not always easy to allow your kids to be kids, but I really try to force myself. By doing so, you can also free yourself. Let your kids find the play and follow their lead, not the other way around. Yeah, that’s the ticket! And who wants to be a harpy, uptight, nagging broad anyway? We can’t always live with safety straps. In the weeks since I shot this it seems even more relevant. Um, has anyone noticed that this non-recession is NOT letting up? Meanwhile, my kids seem to be eating more. While more costly, it does seem important to their growth to take in sustenance. I chat here with Caroline Murphy of Smarty Pants Mama and Christine Koh of Boston Mamas. Just Mamas and the dinner issue. So, eating on budget .. what’s your tip? Check out www.facebook.com/ragusauce to hear more ideas from Mom’s the Word! Oh, poor Daphne, she is suffering from Hickory Hill-itis. No, dear, you are not a Kennedy. Yes, I watched a lot of British dramas growing up and love biographies; so, bear with me. Without seeing or feeling the vibe of my home, I’m asking for help to name my new abode. My hope is we stay here a long time. So long that when my kids have grown they write letters to their friends saying that they are going home to “Juniper Hollow” or whatever the name is. I know, who writes letters? Or maybe it’s that we have moved so often in the last few years I crave permanence, so much that I want to have an instant institution. Something that means something and that stands the test of time. Not a bad gig. I talk about what I do to get my kids ready for back to school and about trends for the tweens. The main crux of the gig was going to NYC and doing what is called a satellite media tour. This is when you see a personality in a faux room on local news. People, like myself, are speaking to Chattanooga, then Toledo, then Houston — quick way to get around the country. They can see me, I cannot see them. I am told their name so I can say things like, “That’s right, Joanne, shopping with your kid can be stressful, but here is my advice…” Of course, going to Searsstyle.com is on the to-do list (kept dropping that middle ‘s’ when I try to go and that doesn’t work). On set, we taped this vid where I give my other pointers AND at the end, I tell you how to get a back to school outfit for your tween. What I learned from doing this SMT? Bad idea to have insomnia the night before. Ugh. The smoked salmon sandwich they brought me really kept me going. Bad idea to travel back home the same day as 26 interviews; it’s a tad tiring. I brought Vivien with me to NYC and that was so wonderful. But that’s another post.